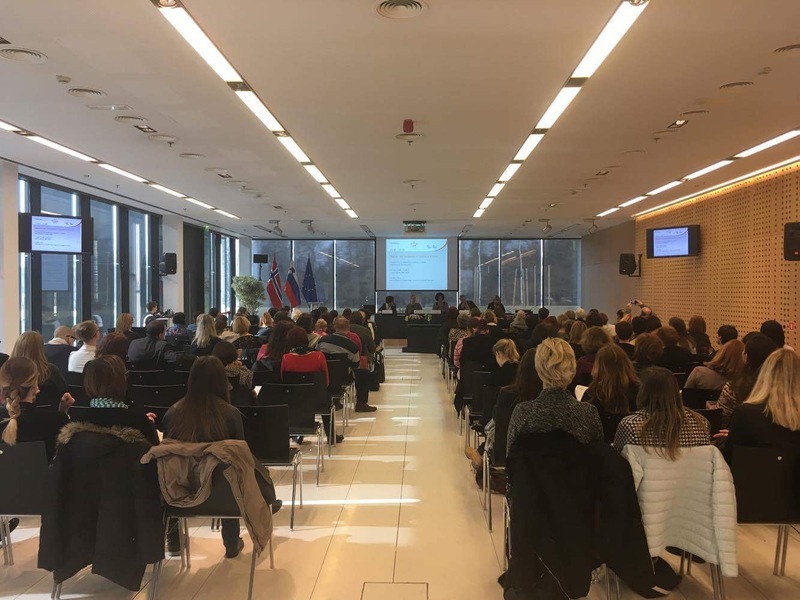 Ljubljana, 21 February 2017 – The conference ‘’Norwegian-Slovenian Cooperation: Gender Equality Has Paid Off!’’ took place on 17 February 2017 in Brdo pri Kranju, Slovenia to showcase the projects in the area of gender equality implemented under the Norwegian Financial Mechanism Programme 2009-2014. A number of keynote speakers discussed the progress Slovenia has made in the area thanks to Norway Grants. State Secretary at the Ministry of Labour, Family, Social Affairs and Equal Opportunities Martina Vuk opened the conference by underlining that Slovenia had been looking up to Norway as a genuine role model thanks to many years of experience in promotion of gender equality. Funding under the projects allowed bilateral activities through which Slovenian representatives gained valuable insight in Norway’s everyday practice in the area. Slovenia has achieved significant progress in gender equality; however, major gaps that call for bridging still exist in work-life balance area and in the economy. Gender equality policy is an important element which helps balance the society and opens door to social advancement. The pre-defined project Towards Equalising Power Relations Between Women and Men implemented by the Ministry of Labour, Family, Social Affairs and Equal Opportunities in partnership with Norwegian partner, and other projects, made groundbreaking steps towards gender equality. Ambassador of the Kingdom of Norway H.E. Mr Olav Berstad, in his opening address, spoke of the transfer of good practices and cooperation between both countries in a number of areas, including gender equality, which had brought positive results and led to progress. He underlined that equal rights for women and men really do pay off and that equal rights had become an intrinsic fabric of the Norwegian culture. According to Mr Berstad, grants were perfect for fostering bilateral cooperation between the two countries. He also congratulated Slovenia for administering the grants in an effective way, and added he looked forward to seeing what the new programming period would have in store. The ambassador welcomed the partnership between both countries in light of common European challenges. Head of Financial Mechanisms Division at the Government Office for Development and European Cohesion Policy and representative of the National Focal Point Mojca Krisch named the five programmes implemented under the EEA and Norway Grants in Slovenia in the period 2009-2014, and focused on the Norwegian Financial Mechanism Programme which advocated, inter alia, gender equality. The grants provided in the area sought to improve gender equality in line with the equal rights policy at the national and EU level in terms of equal recognition, power and participation of women and men in all areas of public and private life. Six projects were implemented in this area worth a total of EUR 1.7 million, i.e. Towards Equalising Power Relations Between Women and Men, OPENN, ODA, Network MEMA, EQPOWEREC and GEQUAL which show how comprehensively gender equality is being addressed in Slovenia to achieve social breakthroughs. Ms Krisch also highlighted that the National Focal Point was pleased to see all project activities were successfully completed, and concluded that the projects generated outstanding results and stepped up progress to gender equality producing long-term positive impacts as well.